It's interesting to hear that 'Fra Diavalo' has been showing recently - it hasn't been seen here as yet. No I don't collect records - am more interested in tape recordings - I like most any kind of music, am not particular. Am pleased you decided not to contact Bob Hope. It would be impossible for us to appear on his show anyway due to our health condition. Thanks your very nice letter 5th.inst. I deeply appreciate your concern re our situation, & your kindly thought & desire to help matters, its certainly a magnanimous gesture, wish I could fully express my feelings apart from a humble thanks, but please do'nt worry Earl, things are not as bad as they seem, I assure you there's nothing to be alarmed about. Frankly, am pleased you decided not to contact Bob Hope, it would be impossible for us to appear on his show anyway due to our health condition. Before Babe got ill we had several offers to do a short appearance with Jackie Gleason, Ed Sullivan etc. but I did'nt feel equal to it, thought we might not be up to par & may be disappointing, so did'nt want to take any chances. I'm expecting to go into hospital for a couple of days, have been troubled with attacks of headaches this last couple of months, the Dr. thinks it may be too much spinal fluid or not enough that's causing it, so they are going to puncture my spine & check it. I told the Dr. if thats not it, it must be TIRED DANDRUFF.!! Pleased to know Cynthia is coming along so well & gaining weight, your big thrill is yet to come when she starts to talk & walk. Yes, this Mid East situation is a mess & certainly looks serious, I pray to God it wo'nt end up in a War, what a disaster that would be to the whole World. I do'nt recall "The Gold Digger" series, but I do remember the names you mention who were in them. I met Eddie Cantor & Joe E. Brown many times. Did you see Cantor a couple of weeks ago on Playhouse 90 in "Sizeman & Co"? he played a dramatic role, also another film with Ed Wynn playing a straight part & last night there was one "The Big Slide" with Red Skelton going dramatic, looks like all the comics have run out of comedy material & turning legitimate - next thing you know, we'll be seeing Abbott & Costello in "The Ten Commandments"! I understand Joe E. Brown is publishing a book on his career in show Biz. It should be interesting, I remember him way back when he was a member of an acrobatic troupe who worked on a trampoline (bounding table) I remember too, Carey Grant when he was with a stilt walking troupe at the Hippodrome New York (about 1912) his name then was Archie Leach, he was an English acrobat. Babe is coming along as well as can be expected, still in bed & unable to talk yet, poor chap, I sure sympathize with him. Well, all for now Earl. Thanks again for your lovely letter. Bob Hope, born Leslie Townes Hope (1903–2003), was an American comedian and actor who appeared in vaudeville, on Broadway, and in radio, television and movies. Hope did many specials for the NBC television network beginning in April 1950. The Suez Crisis was fought by Britain, France, and Israel against Egypt beginning on October 29, 1956. Eddie Cantor (1892–1964) was an American comedian, dancer, singer, actor and songwriter. Joseph Evans Brown (1892–1973) was an American actor and comedian. His autobiography, “Laughter Is A Wonderful Thing” was published in 1956 by A.S. Barnes and Co.
Had I known that you were from out of town, I would have certainly invited you in to wait—while I put on my hearing aid, my wig, put in my right eye and screwed on my wooden leg to meet you! Oh, forgot my teeth too! Thank you for your very nice letter of the 18th.inst. I am terribly sorry I was unable to see you when you called, the reason was I had just returned from the hospital the day before, I was in there overnight for a spinal test, so really was'nt feeling too good - I had been troubled with headaches the last couple of months & the Dr thought it nay be due to spinal fluid pressure. However, everything in that dept. was OK & for some reason my headaches have subsided. Even so, had I known that you were from out of Town (Mrs L. did'nt tell me till after you'd left) I would have certainly invited you in to wait, while I put on my hearing aid, my wig, put in my right eye & screwed on my wooden leg to meet you! oh, forgot my teeth too.! Anyway, next time you are down this way, please drop me a card & let me know & it will be my pleasure to make a definite date. Again many thanks for your kind thoughts & good wishes, deeply appreciated. 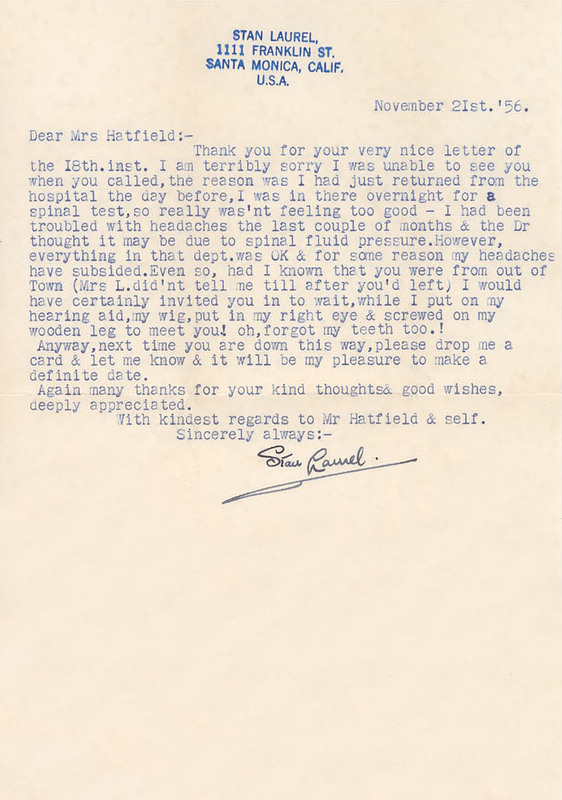 With kindest regards to Mr Hatfield & self. Thanks yours 16th.inst. with enclosure of news items - I really don't know how this reporter figured that Mr. Hardy made that statement due to the fact that Mr. Hardy's speech was affected & he is unable to talk yet - this reporter must think he's DUNNINGER THE MENTAL WIZARD!! Thanks again for your kind wishes & wish you a very Merry Xmas & Happy New Year. Joseph Dunninger (1892-1975), known as “The Amazing Dunninger” was one of the most famous and proficient mentalists of all time performing magic on stage, radio and television. Thanks Elmer [Westover] for the newspaper regarding the Dupont Mill explosion - you were certainly lucky to be out of range - don't think I'd care to live that close to a powder mill - it would make me a nervous wreck! We have been having several brush fires in the mountains here - one still raging (11 fireman burned to death) many thousands of acres destroyed this last month. They have been bringing in a lot of Indian fire fighters...& planes are flying over the fire, spraying chemicals to put it out - it's really serious. Thanks again for the paper Elmer it was very interesting. Wish you a very merry Xmas & a Happy New Year - lots of good luck - health and happiness in '57. The Comedian Oliver Hardy, felled by a stroke Sept. He still clings doggedly to life. If the wishes of his fans can help him, he’ll make it back to recovery. I dropped by Hardy’s modest Van Nuys home to check on his condition. Mrs. Hardy, a small, attractive woman, told me the once-rotund comic is much the some as when he left the hospital last month. His right side is paralyzed. He is unable to speak. He requires nurses 24 hours a day. “His spirits seemed to improve when we brought him home,” she reported. “But he seems to get frustrated by his inability to do things. He will sit and look at a newspaper for a long time and appear to get irritated because he can’t absorb it. “We put him in a wheelchair one day and brought him into the den to see TV. He always was such an avid watcher. But it was evident that he couldn’t comprehend what was going on. Partner Stan Laurel is living quietly with his wife in nearby Santa Monica. Illness has kept him inactive professionally of late, but, he reports, he is improving steadily.